What would Dante (and Boccaccio and Petrarch) say about Italy and the world today if, let's say, they hosted a morning talk show? After my sabbatical hiatus and year in Italy, I am back in Oklahoma with a full slate of classes and other professorial activities. As I return to reading and re-reading Dante and Boccaccio, listening to my students' impressions and novel interpretations of these two masters, I can refresh my blog with new material. Not living in Italy now, the material will be more focused on Dantean and Boccaccian takes on the New World, but don't be surprised to see Italian subjects appear. Follow my posts for some information, interpretation, and, most especially, entertainment. PLEASE COMMENT ON ANY POST PAST OR PRESENT. My first thoughts reach back to earlier posts in 2013 in which I discussed the advent of Dan Brown's new thriller: Inferno. From almost a year's distance, we can see that Brown's book was almost universally panned as poorly written, and yet, spent a good deal of the year on the top of many lists of bestsellers. None of this is surprising. Dan Brown himself spent part of May in Florence talking up his book in a series of events sponsored by the city itself to bring more tourists to town, as if they needed any goading… Some of my most esteemed Dantista colleagues took time from their intellectual labors to consider Dan Brown's book, with the entirely predictable conclusions that Dan Brown is an imbecilic idiot whose novel proves two things: he neither knows how to read or to write. Harrison's criticisms of Dan Brown cannot be denied; indeed, I made some of the same in my first review of the book on this blog. However, another colleague took a different and, certainly, more original if not bold approach to Dan Brown's book. Deborah Parker, a scholar of Dante and the Italian Renaissance at the University of Virginia, co-authored with her husband, also a literature professor at UVA, a book that attempts to take Dan Brown's book for what its worth and to put Brown in context of other authors/painters/ musicians/ etc… who have used Dante to create their own art. 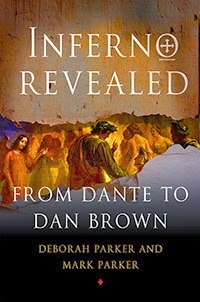 Inferno Revealed: From Dante to Dan Brown turns out to be a very useful guide for the reader of Dante as much as for the reader of Dan Brown's Dante. It is yet another effort by Professor Parker to make Dante more available to readers today. Her excellent website worldofdante.org has already been the subject of this blog and is cited by Dan Brown in the notes to his Inferno. The first half of the book takes a rapid tour through Dante's Inferno giving the reader necessary and nuanced background on many of the important characters and episodes that have made the Inferno standard reading for 600 years. What is key here and what is most surprising is the rich detail of interpretation that the authors can fit into this study. I think most readers of Dante, forget about Dan Brown, would get a great deal of help from the authors' discussions in this book. The second half of the book looks at the important legacy that Dante's vision of the afterlife had on poets/artists/ and musicians that have come after. The authors note that they will stick to English language uses of Dante, so we find Shakespeare, Milton, Pound, T.S. Eliot, and James Joyce treated with clear and concise sections. Then we look at popular or "lower" treatments of Dante in the contemporary graphic artist Sandow Birk's novel and subsequent animated feature based on Dante. After all that the authors had accomplished in the first 2/3rds of the book, I found my self reading the Dan Brown sections at the end with a fair amount of skepticism. I have read Dan Brown's book, and I have noted, as others have, Dan Brown's errors, or to be more generous, "misprisions" of Dante. Thankfully, we do not have to read again how Dan Brown fails to live up to the standards set by Dante, or by Milton, Eliot, etc. Instead, the authors show how Dan Brown gets it right while admitting that he got some things wrong. This is not an apology for Dan Brown, but rather, a generous reading of the ways in which the character of Zobrist, the "villain" has a nuanced understanding of Dante's moral system as author of the Inferno. perdendo me, rimarreste smarriti. by losing sight of me, be left astray. As I approach the conclusion of my year in Italy, my family and I have entered into a waiting period as we try and enjoy our last few weeks in Italy and prepare to return to Oklahoma. Existing in this "in-between" state, reminds me of Dante's Purgatorio. This blog has been mostly occupied with putting people in Hell, since, as most readers of the Divine Comedy conclude, Dante's Hell is the most fun to read. I think Dante might put it another way, since we are all sinners, Hell is where we all feel most at home! Purgatorio, on the other hand, is much-less read, but, unlike Paradiso, I believe most modern readers would find it almost as interesting as Inferno. We should all hope to make it into Dante's Purgatory, since residence their promises eventual admission to Heaven while also allowing for us to have "made a few mistakes" in life. Only Saints go straight to heaven, and they spent their lives in hair shirts or gruesomely killed as martyrs (one of my favorites, is St. Lawrence who was burnt on a grill, which explains the name "St. Lawrence" for a grilled cheese sandwich at a pub I used to frequent). Well, I find myself in Purgatory here in Italy, waiting to move on to the next thing. Dante's Purgatorio echoes with the sound of willing suffering and endured pain. Some of the penitents have to shoulder heavy boulders to cure the sin of Pride. Others have their eyelids sewn shut so as to prevent the envious itch. I know myself well enough to predict that I will spend plenty of time on one particular ledge of Purgatorio: Gluttony. Here the sinners see abundance around them and, like in the famous story of Tantalus, find satisfaction just out of reach. 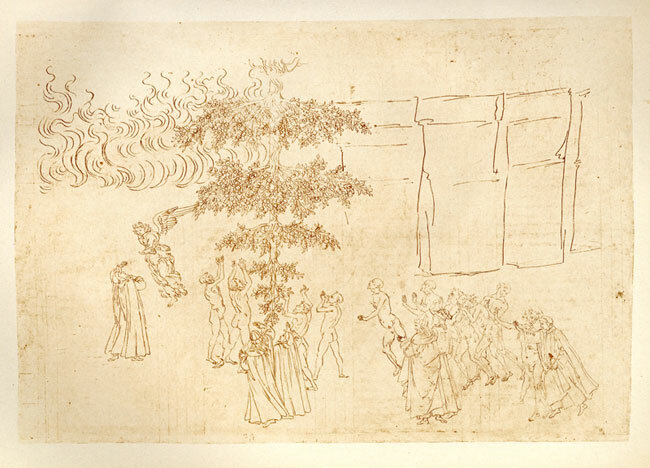 Here is Dante's description of the punishment of the Gluttons from which Botticelli drew the above. per esser pur allora vòlto in laci. nearby, just past a curve where I had turned. tien alto lor disio e nol nasconde. holds high, and does not hide, the thing they want. che tanti prieghi e lagrime rifiuta. which turns aside so many prayers and tears. The sinners are emaciated from hunger and parched with thirst, and easy and apt punishment for their gluttony. But they are not being punished, they are being trained to understand that physical sustenance, although pleasurable, should not substitute for spiritual sustenance, Love of God, that will bring true joy. Their hunger and thirst is neither mortal nor eternal. This will certainly be my Purgatorial fate! But my Italian purgatory is nothing like this; in fact, it is the opposite of Tantalus' annoying quandary. In Italy, I have a cornucopia of wonderful food options at every turn. Indeed, instead of suffering from famine, I have been feasting. Indeed, I think I have discovered the new miracle diet! I have never dieted before, although when I puffed up to over 180 pounds (I am only 5'9) a few years back, I decided to start “watching” what I ate, which translated to not eating an entire carton of ice cream every two days. From the little I know about diets I gather that they have rules about what you can eat. Some of them also regulate when you can eat. Some of them have points that you use to organize your food consumption. Others involve cutting out entire typologies of foods from your diet. Many diets are so complicated that it takes an entire book ($19.99 in paperback, available at amazon.com) to explain. Well, my miracle diet is doubly-miraculous. Not only is it effective, but it is so easy that I need not write an entire book to explain it. There is one rule to my diet. The rule is so short and simple that there is no need for a fancy name for this diet. It can just be called the “Move to Italy” diet. I have now lived in Italy for a year, and I have lost about 15 pounds. My BMI has gone from 25 to 22.9. And now the “miracle” part. I eat whatever the hell I want to eat. My breakfast is a sugary feast, with brioches, cookies, yogurt, granola, and sweet and whole-milky cappuccini. I reliably have an 11 am snack with more coffee, pastries or sandwiches. Pasta for lunch, with salad and salami or other cured meats. Afternoon snack? Of course, sometimes including Prosecco!. Dinner? More pasta, and potatoes, and meat. Let’s not forget dessert(s), which does not inlcude the gelato I require daily. All the while I munch on chocolate bars, potato chips, and even the occasional fruit. Oh yes, I have even started drinking regular coke again. I am in the land of Cockaigne! If I ate this at home in Oklahoma I would see 200 pounds in the rear view mirror, if I could see around my corpulence. But with my new miracle diet, I lose weight. You might object, thinking that living in a Tuscan hill town I walk much more than in the US. Wrong! I walk to work (or bike) everyday in the US. I also am an active recreational biker in the US as well. In Italy, my activity level has actually decreased. I have no scientific knowledge of how this diet works, indeed, I have very little scientific knowledge at all. My guess is that it has to do with all the chemicals and perservatives Americans eat in their food. I also blame it on High-fructose corn syrup. On the other hand, I am positive it has nothing to do with vaccinations or the lack of NSA spying on my Facebook activity in Italy. But I don’t care. I am 40 years old and eating everything I want in Italy AND losing weight, a miracle indeed. But, as I said earlier, Purgatory is not eternal, and moving back to Oklahoma will likely mean that I will need eat more like Tantalus and less like 70s vintage Elvis. And given the Oklahoma heat, that will feel more like Hell than Purgatory. Please send me some ideas for people to judge by Dante's rules. Who do you want to see placed in Dante's afterworld...and please, no current American politicians, that is just too easy. Italian Ultras giving Fascist (Roman) salute. This story by Wright Thompson on ESPN is a must read for anybody interested in Italy today. I found it surprisingly good journalism from ESPN. I think the story has a couple of problems. The author resorts to some easy clichés about Italy. However, he does this to a much lesser extent than most things I have read, and he often uses these clichés in the service of reconsidering a side of Italian culture that gets virtually no coverage in or outside of Italy: the immigrant experience in Italy. Second, I think he could have made more clear the isolated nature of the culture of virulent racism represented by the UltraS, even if Italy, like many countries including the USA, struggles with issue of race and immigration. Read the article for an excellent description of the phenomenon the Ultras, "super fans of certain soccer clubs, and UltraS, Neo-Fascists who use their fandom as cover for violence and violent speech. The line is not always clear. In the best light, Ultras of all types are still quite scary, using planned choreography and Roman candle pyrotechnics, they 'enliven" soccer matches around Italy and Europe. UltraS promote "Ultra- violence" (to adopt Burgess' neologism from A Clockwork Orange), in the past, against Ultras supporting other teams, but now against other races. They also yell racist chants against players on the field, both on opposing sides and even on their own team. Where would Dante place the UltraS? For the complexity and contemporaneity of this issue, it is perhaps the hardest question this blog has had to handle. Please e\be patient with the length of this post. I think the UltraS go in Hell, Circle 5 of the Wrathful, Canto VIII. 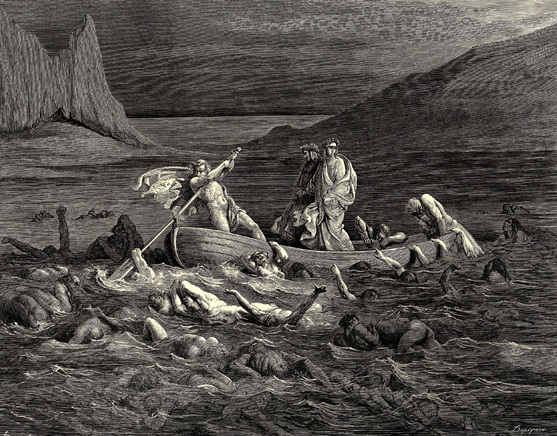 Dante's wrathful (angry) are submerged in a lake of mud, wallowing in the misery of their own uncontrolled hatred. Their anger besmirches their reputation, obscures their humanity, and transforms them into a base nature. Constant conflict marks Dante's passage through the realm of the wrathful. One of the sinners attacks Dante...and Dante attacks him back. Once over the murky waters, perched on high towers and terraces angry fallen angels and wrathful Furies, including perpetually screaming Medusa!, block their entrance to the City of Dis. Dante recoils in fear, proposing to cut short his trip. va per lo regno de la morta gente?" 8.85 can journey through the kingdom of the dead?" di voler lor parlar segretamente. he wanted to speak secretly to them. che sì ardito intrò per questo regno. for he was reckless, entering this realm. che li ha' iscorta sì buia contrada." across so dark a land, you are to stay." ché non credetti ritornarci mai. returning here seemed so impossible. ritroviam l'orme nostre insieme ratto." let us retrace our steps together, quickly." Today's UltraS belong here most obviously because of their manifest, and manifestly public, anger towards those they believe do not belong in Italy. Like the Furies standing guard on their terrace, the UltraS represent themselves as protectors of their city, culture, heritage, and race from outsiders. UltraS are only UltraS when they are in groups with an militaristic leadership structure, since their effect depends on display. The Furies are protecting the evil dead. The UltraS? Perhaps they protect an idea of Italy that is as mythical as the founding myths of Rome itself. Their ideology is directly linked to fascist ideology of Italy as the master of the the Mediterranean Sea, or Mare Nostrum (our Sea). This ideology found voice in Mussolini who, from his own balcony in Piazza Venezia in Rome, persuaded Italians to support his mad folly of colony and belligerence. The UltraS are angry and they are as fearful as they are deluded. The UltraS name itself recalls this isolationist ideology. As the title of this post alludes, Nec Plus Ultra were the words that Hercules carved on his Pillars placed on Western Extreme of the Mediterranean to serve as a warning from the Gods not to " go beyond" Europe. For the UltraS, this reclusion works reciprocally, as a Do Not Enter sign: Nec Plus Intra. With their violence the UltraS forcefully declare their entitlement to their anger, and seek to instill fear in others. Dante's stance on these issues is complex. At times, Dante adopts the rhetoric of exclusion (I am not calling Dante a racist! ), specifically in Paradiso XVI, at other times, Dante also fears what is beyond his world. Indeed, his fear in this canto is about what is beyond "oltre" or "ultra" the walls of the city of Dis. But, like Ulysses in Canto XXVI of Hell, he ultimately chooses to go beyond the Pillars of Hercules, to open himself up to the dangers of experience of the unknown. For this, Dante and Italy has been rewarded with his voice ringing out in the eternal discussion of virtue and knowledge (virtute e canoscenza) that defines culture. Fortunately, these UltraS only represent a far-right fringe on Italian belief, and for their angry words and deeds let them swim in the muck. ***Spoliers Alert**** Info about June 2nd Game of Thrones episode and the end of Dante's "Inferno!" The penultimate episode of Game of Thrones season 3 (don't ask me how I am keeping up with the HBO series in Italy) ended with a bloodbath that few viewers will forget. The viewer has been encouraged to root for the Stark family in the current battle for dominance in this fantasy world, but this episode ended any hope for a quick win for Ned Stark's brood. What caught my attention was the double betrayal that brought about the gory end to Robb Stark, his mother, and his wife and unborn child. The episode was skillful in emphasizing the seething anger that the spurned lord Walder Frey had for the Stark family, has Robb had broken his promise to take on Frey's daughters as a wife, a political marriage that would have brought Frey's descendants into direct lineage to the kingship. Frey repays this betrayal of a political deal with a more nefarious deed. He welcomes the Stark family to his castle and agrees to marry his daughter to a lesser lord, all the while having planned to massacre his guests after the nuptial celebrations. Shockingly for a tv drama, this all happens before our eyes and agape jaws. Lord Frey, a crusty old curmudgeon, losses his wife in the events. But, as he says, he can get another. As with everything on HBO, Dante has been here before...and done it better. che quei faceva il teschio e l'altre cose. than this one chewed the skull and other parts. Ugolino spends eternity gnawing on Ruggieri's skull and other parts, by which I understand his BRAIN! The story of Ugolino and Ruggieri is complicated, even more complicated than the meandering Game of Thrones plot and the names are just a tricky. But, to shorten it a bit, Ugolino betrayed his side in a political feud (the Guelphs) to join with Ruggieri to gain his own power. Ruggieri, not trusting the proven traitor Ugolino, accuses him of being a double-agent against Ruggieri's party (Ghibellines) and imprisons him, along with his sons, and starves them to death. Dante's poem leaves purposefully ambiguous whether Ugolino, imprisoned with his sons, eats them as a sort of mistaken Eucharistic offering to put off his own eventual and inevitable death. Here we have a double-betrayal, but where one party Ruggieri receives worse punishment because his betrayal includes innocents, Ugolino's family. Ugolini is not blameless, but he "gets to be on top," so to distinguish the slightly lesser nature of his betrayal...it was just politics, while Ruggieri exacts revenge on an entire family. The Game of Thrones picks up on this by having Robb Stark's betrayal, the spurning of a promise to a political marriage, massively overshadowed by Frey's revenge, which takes the blood of the innocent (unborn child) as well as the guilty. Frey's sin, in Dante's language, becomes more grave when we consider that he A. Kills his guest (Ptolomea for Dante) and his lord (Judecca for Dante). So, let's imagine Robb Stark and Frey together in Dante's Hell. Stark's sin is lesser but still a political betrayal, so he gets to be on top. While starvation was a key for Ugolini and Ruggieri, in The Game of Thrones we have a nuptial feast. What punishment fits here? Stark cutting up Frey only to feed him to himself, since marriage seeks to use one's own fleshly product (a child) to further one's own power? What do you think would be a good punishment? Am I too harsh to say Dante would put Robb Stark in Hell as a political traitor? Maybe his sin is lust? Use the comments button to make your suggestion. While not reading junk fiction based on Dante, or riding my bike up and down Tuscan hills (and in and around Tuscan thundershowers! ), I am also doing some real academic work! My current project is a translation of Giovanni Boccaccio's "Minor" Latin Works, or short odds and end that nobody has translated yet. Most of these texts are Boccaccio's Letters, 24 in total, that he wrote to friends and colleagues. I am now preparing the 3rd drafts of these letters, and I have come back to the XXIst, one of my favorites. Why? Because the entire letter describes, in gory detail, Boccaccio's maladies and the cure for these maladies. Written in 1373, Boccaccio is an old man, 60 years old, living in discomfort in his hometown, really a village, of Certaldo. It makes for fascinating reading. I provide my translation of Boccaccio's description of his sickness. "Thus, since the last time that I saw you, whom I always hold in high honor, my life has been like death, afflicted by tediousness and annoying even to me. It has not been vexed by just a single torment. Indeed, first of all I have an incessant and burning itch, a dry rash; to scratch this dry patch and dead skin it takes the constant application of my fingernails both day and night. Add to that the heavy constipation of my bowels, perpetual kidney pain, swollen spleen, conflagration of my bile, panting cough, stuffed up chest, and congested head, and many other maladies, which if I enumerated, you would certainly say that all of my body languishes and my humors are all in discord." che non potean levar le lor persone. who had not strength enough to lift themselves. del pizzicor, che non ha più soccorso; and fury, and there was no other help. o d'altro pesce che più larghe l'abbia. or of another fish with scales more large. "O tu che con le dita ti dismaglie," 29.85 "O you who use your nails to strip yourself,"
etternalmente a cotesto lavoro." your nails hold out, eternal, at their work." 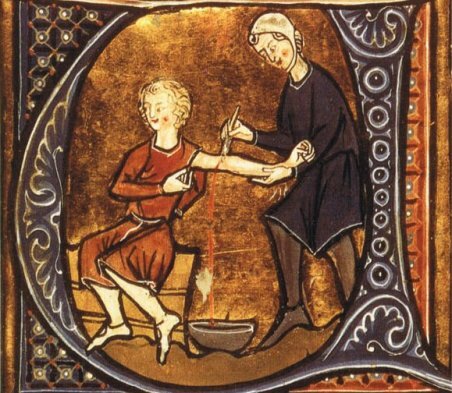 However, I find Boccaccio's description of his cure much more gory than the description of the sickness itself, which comes across as pathetic. Boccaccio's cure, delivered by a local doctor (Boccaccio does not like doctors, much like his friend and mentor Petrarch), outstrips his description of the sickness. "The doctor, seeing that fiery stain, a sign of inflammation of the liver, reasoned from that evidence that it was necessary to immediately expurgate the superfluous and harmful material, and that that sickness required swift care; and if that cure were done, health would return on the spot; but if it is put off for a day, within four days certainly I would be dead. I feared, I confess, and I ordered that they carry out the doctor’s order. Without delay, the instruments were prepared for my excoriation, iron and fire. The irons having been reddened, they were repeatedly driven in, extinguished, and removed from my flesh, which had previously been shaved after having been burned in the same place. That skin having been broken by repeated blows, over and over again these hot irons were inflicted on me, not without my great torment. Taking these ill humors out of me was not done without the loss of much blood, indeed, as the doctor asserted, the deadly poisoned came out with the blood: then the doctor said, 'you are healthy.' "
Yikes! As Virgil says in Book 12 of the Aeneid (which Boccaccio certainly knew well) "Aegrescitque medendo," or the cure inflames the malady, or even more colloquial, the cure is worse than the disease. Permit me a reflection about the differences between Dante and Boccaccio's representations of physical illness. For Dante, Hell's punishments physically manifest the interior corruption, perversion, or exuberances of the soul. Illness and other physical suffering are allegorical symptoms of spiritual disease: physical disease is punishment for spiritual disease. While in Purgatorio, the diseases are curable, in Hell they are chronic and terminal. But for Boccaccio, here again showing signs of his "Humanism," his disease is only a symptom of old age. Illness keeps him from working, and when healed, albeit with great pain, he picks up the pen and composes the letter describing his ordeal. Writing is a symptom of recuperation, a sign of mental health. Perhaps this is an effect of living through the Black Death, which Boccaccio described most famously in the Introduction to Day One of his Decameron: perhaps their is no explanation for Divine Justice in sickness. In Dante's Genes: Did Dan Brown's "Inferno" decode Dante's DNA? Globalmoxie is retiring! / Globalmoxie si pensiona.